Pet stain removal is not as easy as you might think. If you are getting ready to sell your home and have unsightly carpet stains, you may be tempted to rent a carpet cleaner to get rid of them quickly. While there are a lot of small fix it jobs you can do yourself to save time and money, this is not one of them. If you use the wrong cleaning solution or try home remedies to get stains out you could end up making the problem worse instead of better. The reason that pet urine is hard to remove from carpets is because often the stain is not noticeable immediately. If it is just a one-time accident, it is not too bad. But most animals will relieve themselves in the same area each time, so if your pet is urinating behind your couch the stain could remain hidden until the furniture is moved. The longer a stain sits the harder it is to remove. Another problem is that some stains are harder to remove than others and you don’t want to ruin your carpet through trial and error. Your pet’s urine, especially from male cats or dogs, is highly acidic and has an odor similar to ammonia. This is a very difficult smell to cover up. Room deodorizers and carpet sprays and powders cannot effectively remove these odors. One mistake that many pet owners make is using natural cleaners like vinegar/water solutions which are safe for animals, but does nothing to remove the odor from your carpet. Likewise, hydrogen peroxide solutions can discolor carpets due to the fact that it has a slight bleaching effect on fabrics. Instead of a pet stain you could end up with a discolored or bleached spot that still smells like urine despite your best efforts. In situations like these, when dealing with odors and carpet stains, professional carpet cleaning is preferable because certain types of stains require special treatment to remove. Most attempts at diy carpet cleaning actually push stains further into carpets by using too much water and not extracting enough out. Carpet cleaners use an enzyme treatment to break down the components of pet urine which is a more effective way to remove stains and odors. The enzymes neutralize the acidity in urine which helps eliminate the odor as well. It is much more effective to remove pet odors than try to cover them up with perfume sprays. Anyone who walks into your home will be able to detect that odor no matter how much spray you use. For an estimate of carpet cleaning costs, contact us at Carpet Care Specialists. We provide expert cleaning services to restore your carpets to their former beauty and restore the fresh smell to your home. Hardwood floor cleaning is a very important factor of owning wooden floors. Without regular cleaning, those immaculate hardwood floors can quickly deteriorate, lose its shine, and cause long-term issues for you in the future. This article will discuss four reasons why regular cleaning is important. It may seem like hardwood floors wouldn’t need as much vacuuming as carpets, but that’s only because you can’t see the grit as clearly as you can on carpet. With hardwood floors, there is plenty of dust and grit that gets caught underfoot which can destroy the finish. Weekly vacuuming will prevent this. Have you ever looked at your hardwood floor or other wood furnished pieces in your home and wondered why it looked so cloudy? Excessive use of hairspray could be the culprit. If you ever use hairspray when you are standing on a hardwood floor, clean the area up with a window cleaner so you don’t run the risk of damaging your beautiful floors. Be careful about traipsing in rain or snow from your boots into your home. When water hits wooden floors it will not only ruin the wood finish, but damage the wood. Sop up any water residue off the floors to prevent staining. One way to protect your floors from this is laying a welcome mat at the front of the doorstep. Areas of your hardwood floor that are frequently walked across can wear the wood finish quickly. Prevent this by adding a few throw rugs. You do want to look at the material of the rug before using it as rugs with rubber backing can create humidity which will damage the wood. Even though our name is Carpet Care Specialists, our cleaning service is also available to homeowners with tile floors. We understand that tile floors can get just as dirty as carpeted ones, sometimes even more so. Unlike carpeted floors, the dirt has no place to hide. This can cause grout to form between the tiles, permanent staining, and the formation of mold. Because of our experience and skills, our cleaning crew can detect grout development before you ever see it. If you neglect tile care for too long, you could end up with dull-looking floors that look old long before their time. Grout that is allowed to grow unchecked eventually eats through the tiles and causes them to break apart. You have no choices but to replace all of the tiles when this happens. Before we start cleaning your floor, we must determine how it was constructed. The type of materials determine how we approach cleaning it. We then sweep and vacuum your tile floor to ensure that we remove dirt and debris before we start the actual cleaning process. Next, our professional cleaners pre-treat your tiled floor, scrub it by hand, and rinse it clean. We use high-powered drying equipment because we understand that you want to walk on your floor as soon as possible. Regular professional cleaning is the best thing you can do to extend the life of your floor tiles by keeping them free of grout. You should also check the cracks between your tiles frequently and wipe away any grout or mold that you see developing. We recommend using a mixture of baking soda, vinegar, and water to remove light staining. When you notice deeper staining, be sure to schedule a cleaning from Carpet Care Specialists as soon as possible. If you have small children or pets in your home, you are well aware that your carpeting periodically has stain problems. Trying to remove stains from bodily fluids, is not fun and can be upsetting when the stain does not come out completely. Hiring a professional to clean your carpets is the best thing that you can do in this situation. They have heavy duty vacuum cleaners and steam cleaners which can remove any stain that your carpet has acquired. The carpet will come out clean and any prior stains will be unnoticeable to the human eye. Pet stains can be a reoccurring situation. Your pet may chose an area to use over and over again as a spot to relieve itself. This can happen if you have an older animal or a pet with a medical problem, so be sure to take your pet to the veterinarian to try and stop this behavior. In the meantime, getting your carpet cleaned can give you a breath of fresh air, uplifting your spirit, while saving your carpet. Small children that are potty-training can not always help having accidents. You might try to blot up the area and put some chemical cleaner on your carpet. This may help a little, but if you are using the improper cleaning supply for your carpet material, you can compromise the fibers. Stain removal done by Carpet Care Specialists is guaranteed to remove all stains left by pets or small children for a price that is sure to please. You will be able to keep your existing carpet, saving you money. You will be happy with the results that Carpet Care Specialists will give you. Give them a call today to help you renew your old-looking worn out carpeting. You will be surprised on how much you can turn a stained carpet around. Regular cleaning helps your upholstered furniture retain its original appearance. Failure to keep your upholstered furniture clean makes it wear out faster and forces you to replace it. New furniture is expensive and most people don’t have the budget to replace it frequently. Dirty furniture contributes to poor indoor air quality. This can cause frequent colds and other respiratory problems among your family members. Bacteria can live deep within your upholstered furniture. When it is released into the air, it may cause serious illnesses. Having your upholstered furniture cleaned at regular intervals helps prevent unpleasant odors from developing. At Carpet Care Specialists, we train our staff on how to use the best cleaning techniques on every type of upholstery. Some of the fabrics we are experienced with include suede, cotton, micro fiber, silk, and cotton. We remove cushions from your couches and chairs during the cleaning process to ensure that we reach every part of your furniture. Our carpet care experts also use heavy-duty industrial equipment that the average homeowner is unable to access. We are always available to answer your carpet and furniture care questions or provide you with a quote for our services. You can schedule a one-time appointment or reserve our services at regular intervals. 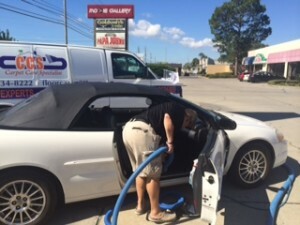 Because we strive for 100 percent customer satisfaction, our company provides extensive training to our technicians. We also carry an endorsement from the Institute of Inspection Cleaning and Restoration. You love your cat or dog, but you don’t always love the messes they leave on your carpet. Since most cats and dogs eventually have a potty accident in the house, the smell of urine in your carpet may be overpowering. Even if the smell seems to diminish with time, the damage to your carpet does not. Pet stain removal services from Carpet Care Specialists quickly eliminates the odor and restores the look and feel of your carpet. Most pet owners wipe up urine with towels, cover the area with a room deodorizer, and assume that the problem is solved. This is rarely the case. When your dog or cat urinates on the carpet, it travels to the carpet fibers, backing, padding, and eventually settles on the sub floor. Once it has penetrated this deeply, the odor can become permanent. That’s why it is so important to contact a professional pet stain removal company as soon as possible. In addition to a long-standing odor, you also run the risk of permanent staining if you wait too long or use home remedies to clean up your pet’s accident. Because urine is acidic, it is a favorable environment for bacteria to grow. This puts you, your family members, and all of your pets at risk of becoming ill. Our professional grade equipment and powerful cleaning agents eliminate approximately 99.9 percent of all germs and bacteria caused by your pet’s urine. Once we finish cleaning your carpet, it will be just as if your cat or dog never had a potty accident in the house. Feces and vomit on your carpet are the other unpleasant realities of owning a pet. However, you don’t have to deal with any of these messes on your own when you become a customer of Carpet Care Specialists. We have served the Emerald Coast of Florida for the past 30 years and look forward to working with you too. CCS floorboard cleaning at Pet Supermarket raising funds for Breast Cancer Awareness! Great success and lots of fun meeting our furry friends. If you would like to help support the Breast Cancer Awareness Walk contact our office to purchase raffle tickets.